From the 2014 dispute. For the 2016-17 dispute, see here and here. 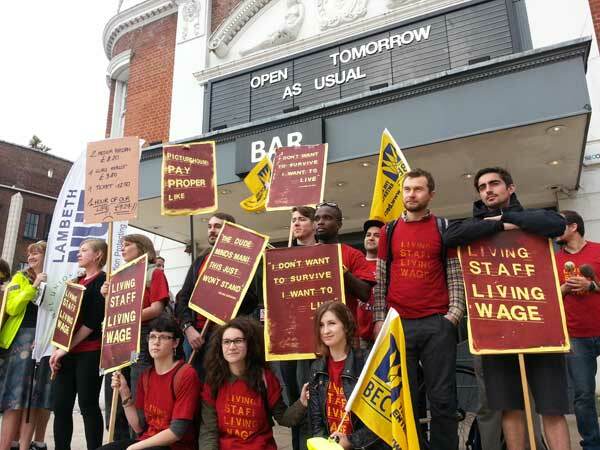 A socialist who works at the Ritzy Picturehouse cinema in Brixton, South London spoke to Solidarity about the Ritzy workers' Living Wage struggle (in a personal capacity). What's the nature of the workforce at the Ritzy? Tube cleaners in the RMT union have faced a lock-out as managers sent them home for refusing to use “biometric booking-on” machines. The machines are intended to replace the existing system of booking on by signing in with station supervisors, and by phone. They require cleaners to enter a fingerprint. Mayor of London Boris Johnson has bought three water cannons for the Metropolitan Police despite the use of these weapons not yet being authorised by the government. Johnson claims that the use of water cannons could prevent disorder such as the London riots of 2011; it will allow the Met to counter-act any rioting this summer. Senior bosses in the NHS have enjoyed an average pay rise of 6.1% over the last two years. Some have also received bonuses of up to £40,000, more than double the annual salary of many frontline NHS staff. 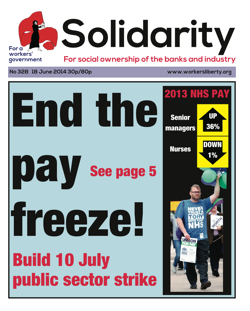 Solidarity and Workers’ Liberty activists will seek in the May 2015 general election to work with other socialists in the Labour Party and in the labour movement to create a clear socialist voice within the campaign to win a Labour government. As against Ukip, the Tories, the Lib-Dems, possible Tory-Ukip or Tory/ Lib-Dem coalitions, or a possible Labour/ Lib-Dem coalition, we are in solidarity with the broad labour movement and its desire for a Labour government. On 13 June newly-elected Ukrainian president Petro Poroshenko and Russian president Vladimir Putin spoke for the first time on the phone. The Russian government has, for now, rejected calls from the pro-Russian separatists in control in Donetsk (eastern Ukraine) to send Russian troops into Ukraine. Yet in several respects a negotiated settlement looks somewhat further away. Russia has stopped gas supplies to Ukraine, citing unpaid bills. Ukraine has lodged a counter-claim for a refund on gas purchases for which, it says, it paid too high a price. On 14-15 June, the National Campaign Against Fees and Cuts hosted two national meetings, Class[room] Struggle and the Free Education Meeting. Speakers involved in the dispute at Lambeth College opened the first event. Discussions throughout the day ranged from looking at the class struggle from a gendered perspective, anti-racism campaigning and living wage struggles on campus. Warwick Anti-Racism Society, supported by Warwick University UCU, organised a demonstration on 12 June, in protest against the rising presence of far-right extremists on their campus. Over 200 students and trade union activists attended to oppose National Action, a group who want to “ethnically cleanse the UK of Jews and non-whites”. They are targeting universities because, according to their strategy pack, if they cannot tap into this market then they cannot succeed at all. Ed Miliband has called for a “proper investigation” into police conduct during the bloody confrontation at Orgreave during the 1984-85 miners' strike. The 'Battle of Orgreave' saw thousands of police violently confront picketing miners in South Yorkshire, leading to many injuries. Almost a hundred pickets were then arrested and charged with riot, unlawful assembly and other offences. However, when the cases came to trial, all collapsed and were dropped, undermined by fabricated or non-existent evidence.